(M) Vintage 70s Men's Cabana / Lounge shirt. Royal blue w/ White Stitching! Belted Back! 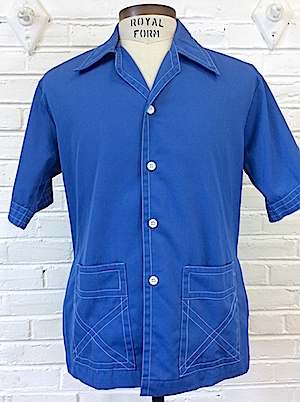 Home > Items just added 4/3-4/17 > (M) Vintage 70s Men's Cabana / Lounge shirt. Royal blue w/ White Stitching! Belted Back! 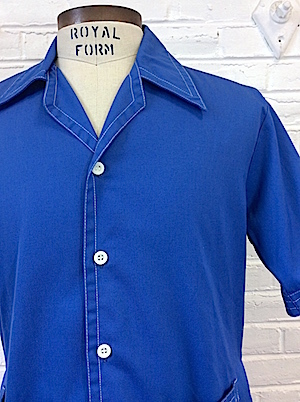 Vintage 1970s men's cabana shirt. 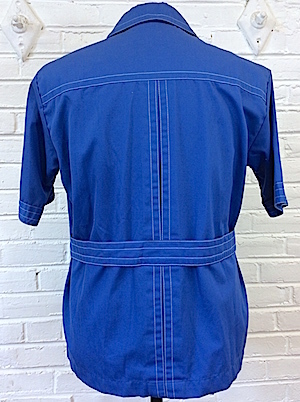 Royal blue poly/cotton with white top-stitching. 2 over-sized lower pockets with X stitched in white. 4 white contrasting buttons down the front. Cuffed shortsleeves, also with white top-stitching. Deep V neckline. Attached decorative "belt" in back. No tags, but very awesome vintage lounge wear!